We're putting the spotlight on a student run benefit fashion show for veterans, military members and their families. Check out this wonderful event. 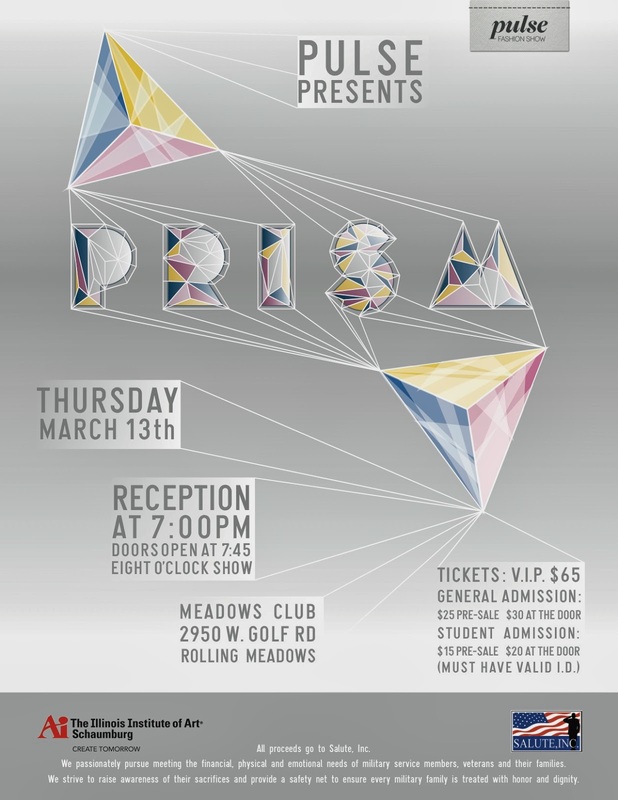 This year, the Fashion Production class of The Illinois Institute of Art – Schaumburg named their annual fashion show Prism. The event will take place at the Meadows Club in Rolling Meadows, IL on Thursday, March 13, 2014. Doors will open at 7:45pm; and the show will start at 8pm, where a silent auction and a raffle will take place to benefit Salute Inc.; an organization that provides military members, veterans and their families assistance with their financial, physical and emotional needs. Prism will showcase the skills of the students in the Fashion Show Production class, together with students from other programs. The class’s efforts in organizing the show has been overwhelming. From creating fund raisers to managing the budget, from picking the color scheme of the logo to the look of the stage; all efforts were made to benefit Salute Inc. Prism is redefining beauty in a different spectrum with courage and confidence in the foreground. General Admission tickets will be available at the door at a rate of $30 and is pre-sold for $25. Students who present their valid IDs get a rate of $20 at the door and $15 pre-sold. VIP tickets are also available for $65; which entails a free drink and hors d’oeuvres prior to the show. Proceeds of the show will be donated to Salute Inc. whose mission is to raise awareness of their sacrifices and provide a safety net to ensure every military family is treated with honor and dignity. Salute Inc. is a non-profit 501(c)(3). Donations of merchandise or finances will be greatly appreciated and will be very essential to our show. We will provide tax IDs for all our donors. The whole show is entirely student-run; and as mentioned earlier, all proceed will benefit Salute Inc.